Action from Lenzie's win over Paisley. Lenzie achieved a deserved, and a much-needed, BT West Division 2 win over Paisley at Viewfield on Saturday. In their first match for a month - due to the break for the autumn Scotland internationals - Lenzie ran in five tries in a 31-15 success over a Paisley side sitting third in the league table at start of the play. 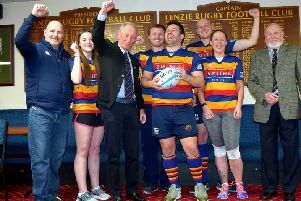 Lenzie scored five tries in their victory over Paisley. Despite having won just two of their opening 10 league games, from the kick-off Lenzie looked the more likely team to take the points against a side who beat them 57-12 earlier in the season. But yet again they conceded the first score early on when Paisley ran in an excellent team try. However Lenzie responded well and passed up a number of opportunities before Ruaridh Carmichael crashed over from close range to level the scores at 5-5. Paisley came back into the game and tested the home side defence and Scouller, Slade, Brett and Fraser showed up well for Lenzie. Just before the break Paisley slotted a penalty to go in 8-5 ahead. But the second period belonged to Lenzie with Scouller and Deacon scoring tries early on to put them in the driving seat. The backs were now receiving good quality ball from the forwards and McCrae was distributing well at scrum half. Midway through the half young Gavin Cruickshanks made his debut and he quickly made his mark with telling breaks and a well taken try under the posts, converted by Scouller. Gregor Fraser rounded off the scoring for Lenzie to send the large home support away in a festive mood, happy with their first win since October 8. Man of the match at centre was Graham Condie with David Nesbit not too far behind. The win enabled Lenzie to leapfrog Waysiders Drumpellier and move out of the bottom two. Next week Lenzie are away to Clydebank at Whitecrooks with a 2pm kick-off. Allan Glen’s were left without a match when their BT West Division 1 fixture at home to Helensburgh was called off. This Saturday Glen’s, who currently sit fifth in the table, travel to face third-placed Carrick.